SDS Software – Created by Hibiscus Plc as a joint development with Lexeus Ltd. If you make, import or distribute hazardous substances, you must supply your customers with a safety data sheet. It’s the law. Using our 35 years’ experience in the hazardous goods labelling industry, Hibiscus have designed the Prometheus SDS software package to simplify and streamline this process, saving you time and money; Prometheus is a simple, flexible and cost-effective solution to the problem of creating, storing and distributing your own Safety Data Sheets. Designed for flexibility and ease of use, Prometheus allows you to create customisable templates and layouts for individual markets and customers. Its built-in database lets you store and manage your templates so the creation process can be quickly and easily automated. You can create appropriate templates for each of your target markets whilst basing them all on the same basic health and safety information about your product. Once you’ve entered your information, SDS can be created in the styles of your choice. You can also clearly distinguish your SDS’s by importing your company logo, which can appear just at the top of your SDS, or on every page. If you supply products under subsidiary names, you can also create separate templates containing their relevant logos. Creating SDS’s is quick and easy and our simple WYSIWYG (what You See Is What You Get) style interface, makes creating Data Sheets as simple as filling in boxes by picking phrases from a list. We supply Prometheus with a basic set of templates and will even tailor them to suit your individual requirements. You can also create new templates to suit any new requirements, either from scratch, or based upon one of your existing templates. 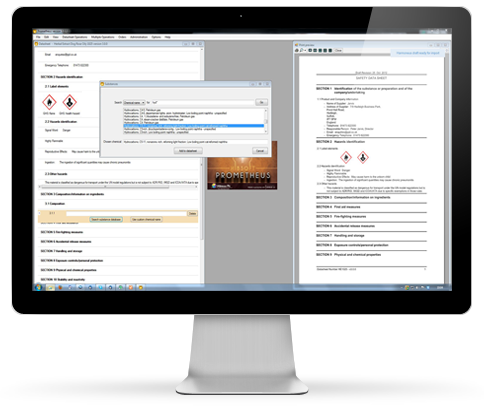 To create a safety data sheet, just select an appropriate template and start filling in the information for the various sections that appear on screen. In most cases this involves simply picking phrases from intelligent lists – lists that show only phrases appropriate to that entry. If you need to add anything extra for a particular product that is not catered for on the template, you can simply add new elements ‘on the fly’. 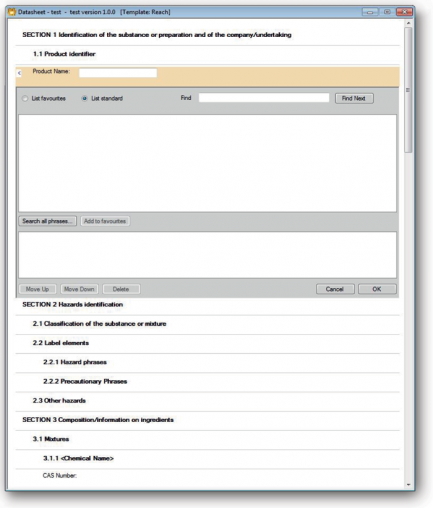 Best of all, if you use our Harmoneus 2 sister product to classify your substances, you can simply import your information and the bulk of the SDS will be automatically filled in for you. Prometheus comes with standard SDS phrases in a wide range of languages so that you can generate the SDS’s in the language of your choice. Other language versions can be made with just the click of a mouse. Even bi-directional Arabic, where the text flows from right to left, but numbers flow left to right, is fully catered for. If you don’t ship abroad you can simply purchase the English only version with the option of inserting additional languages at a later date. You can view the data sheet on-screen at any time to see exactly what the finished result will look like. If you then need the same SDS in another format, just use the ‘translate’ function to copy all of the information onto another template in the format of your choice. Creating another language version is just as easy. When the time comes to output your SDS, you can print it out directly or send it to PDF. All PDF’s are sent to a central repository from where they can be emailed to your customers. Prometheus keeps a record of which customers your SDSs have been sent to, so if an SDS is re-issued every customer who previously received it can be automatically sent the new version. Whenever you change a safety data sheet the last ‘approved’ version is preserved so that you have a complete ongoing historical record of the development of each SDS. Prometheus not only keeps a record of which customers have received which SDS, it also records which versions they’ve been sent. Prometheus SDS software can be used independently, as your ideal SDS creation and distribution solution, or integrated with labelling software to form an integrated solution which covers your labelling requirements – without the need for dual entry of data.